The Las Vegas gunman set up cameras inside and outside his hotel room before firing for nine minutes at the concert crowd below. Police revealed that Stephen Paddock had placed one camera in a food service cart outside his room before he fired on concertgoers at a "progressively rapid rate" through windows on the 32nd floor of the Mandalay Bay Hotel and Casino. In the latest news conference, Sheriff Joe Lombardo said all but three of the 59 who were killed have now been identified. 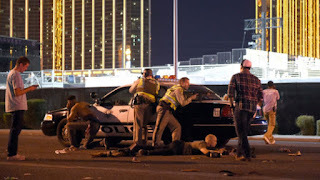 He said patrol officers acting on their own and without the direction of a supervisor were the first to react to the situation and close in on Paddock's room. The officers evacuated people from rooms floor-by-floor between storeys 29 and 32 before converging on the room. A SWAT team then used explosives to gain entry, where Paddock was found dead among his arsenal of weapons. A hotel security guard who approached the room during the rampage was shot through the door and wounded in the leg. Three search warrants have been executed since the attack on a country music festival on Sunday night - one in the hotel, and separate ones at Paddock's homes in Mesquite and Reno. Sheriff Lombardo said officers discovered five handguns, two shotguns and a "plethora" of ammunition in the Reno property. Earlier it emerged 19 firearms, explosives and several thousand rounds of ammo were found at his home in a retirement community in Mesquite. Some 23 guns were found inside his hotel room, some equipped with scopes, along with two "bump stocks" which allow semi-automatic weapons to be fired continuously. Officers have also found several pounds of ammonium nitrate, a chemical used to make explosives, in his car at the hotel. Paddock's girlfriend, 62-year-old Marilou Danley, remains a person of interest in the shooting. Ms Danley has travelled to the Philippines and has been speaking to officers. She will be questioned when she returns to the US.